Seasonal manipulatives and candies add some extra fun to learning activities. During our Valentine’s theme activities we’ve been using a set of chocolate kisses for all sorts of hands-on activities. Here we using them with our free printable Valentine’s Day shape mats to practice recognizing and creating 2D shapes. 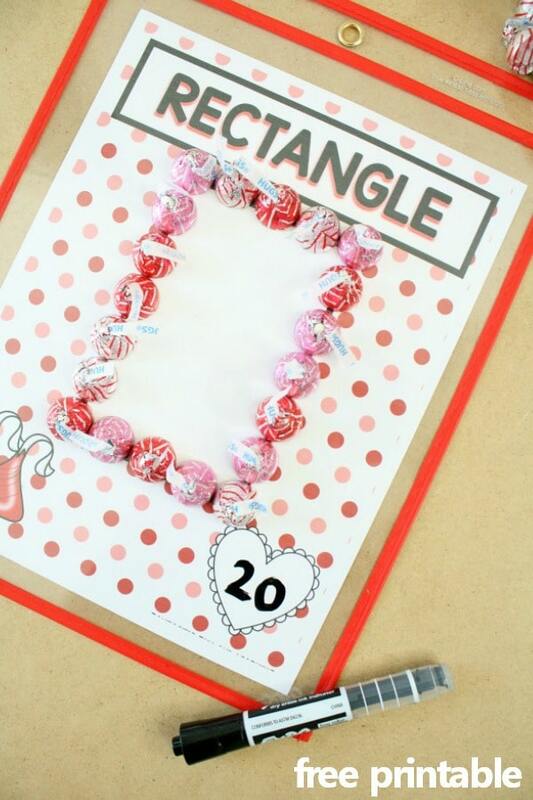 This activity works well as a preschool or kindergarten center activity or table time option. ABOUT VALENTINE’S DAY AND CHOCOLATE. You’ll especially love how easy this activity is to prep! 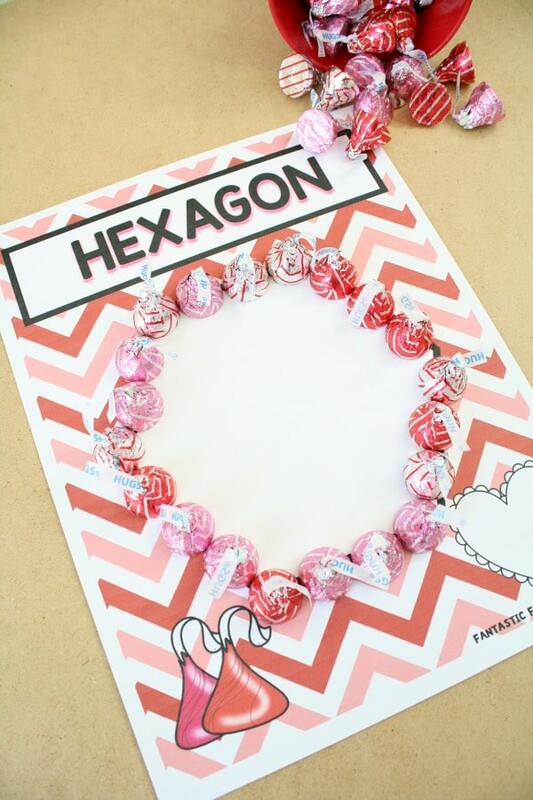 All you’ll need to do is print out the Valentine’s Day shape mat set (available in both color and black and white) and grab a pack of chocolate kisses. I like to use the Valentine set, but it isn’t entirely necessary for this particular activity. You can easily differentiate which set of shapes kids get if needed. Also be sure to introduce the math vocabulary word “perimeter”. Preschoolers do not need to know this term in depth yet, but gently exposing them to the term in context will give them valuable background knowledge to pull from later as they try other activities like measuring perimeter. 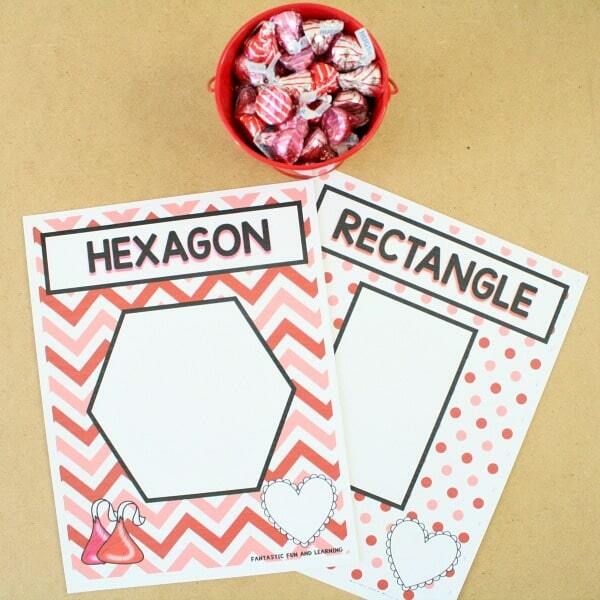 If you’d like to weave in a bit more math, you can also have kids count and record the number of kisses they used to make their shapes. Laminate the pages, or save time and laminating film by simply popping the sheets into Dry Erase Pockets. 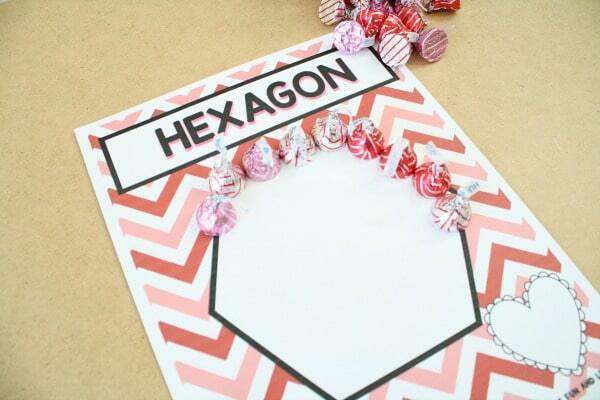 Kids can count their kisses and then record the number in the heart on the sheet. Personally I like to do the recording activity in small groups so that we can discuss observations and compare amounts for the different shapes. I would do this after the kids had time to explore freely and create the shapes independently during math centers or table time. 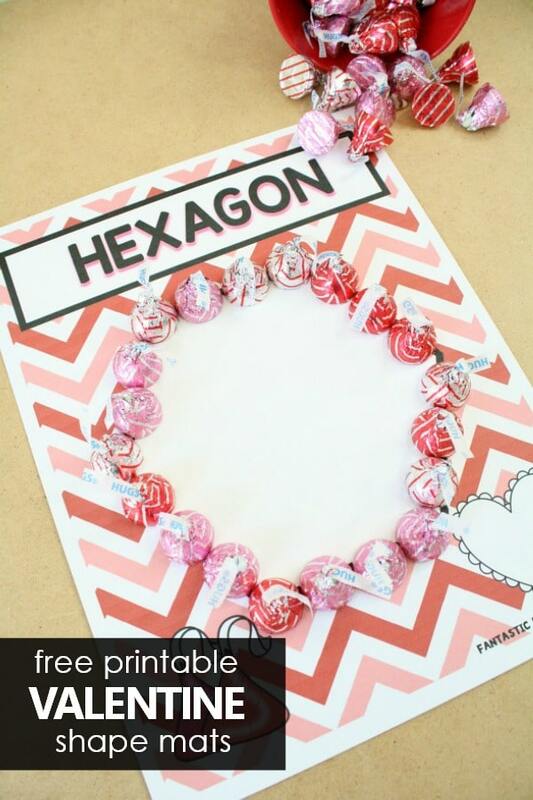 Click the pink button below to get a free printable copy of the Chocolate Kisses Shape Mats. 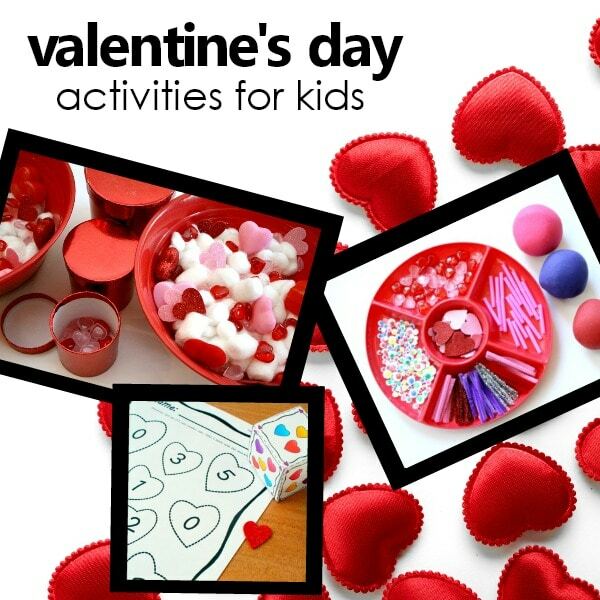 Visit our Valentine’s Day activity guide to help plan your Valentine’s Day theme.